I'm having a difficult time grasping "D.S., D.S. Al Coda, To Coda" based on the online explanations I've come across. Below is the specific example that I'm attempting to play. Does the Dal Segno symbol mean "repeat the previous passage"? Up to where? When do I play the coda? Where it says "To Coda", is the circle with the cross through it hovering above the exact place that you jump to the coda? I'm probably overcomplicating a fairly straightforward concept here, but I'm confused. If anyone could simplify this for me or explain what to do in this specific example I might be able to wrap my head around it. Thank you. The coda here is the final bar. 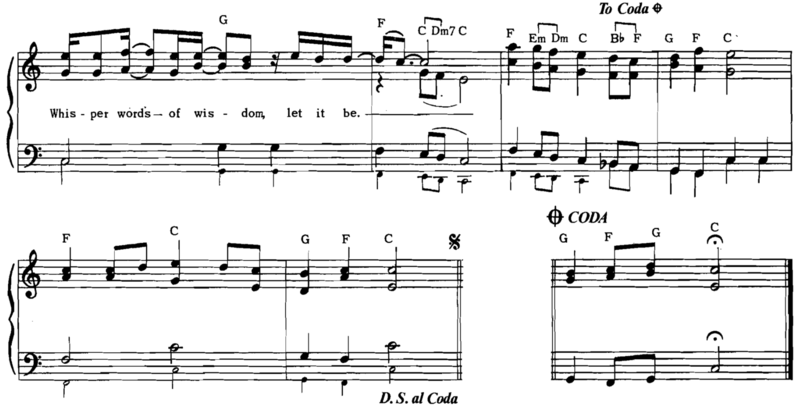 Coda means "the tail" In this case of LET IT BE it is only one bar. 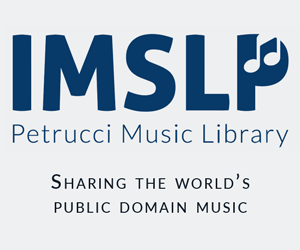 Does the Dal Segno symbol mean "repeat the previous passage"? 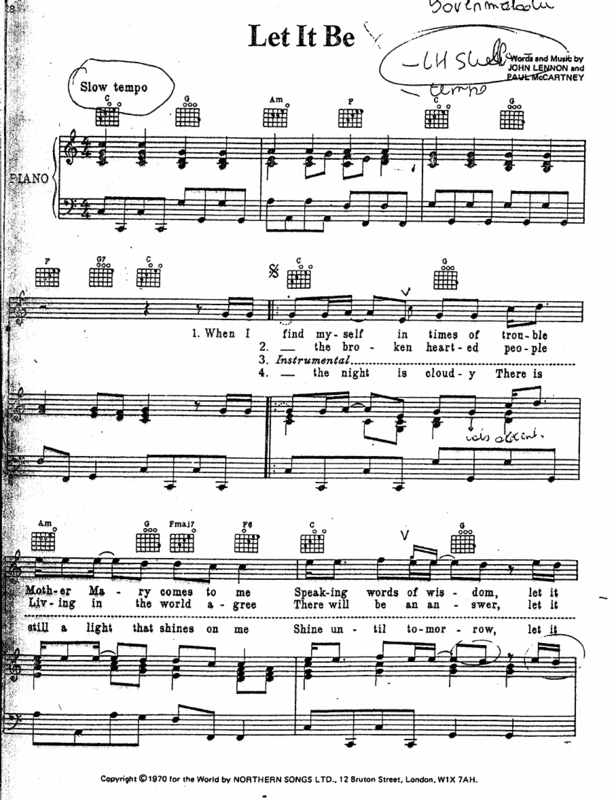 this segno refers to an earlier same segno, probably at the beginning of the 3rd verse of LET IT BE or at the beginning of the refrain. That means you have to go back to the other sign (segno) and repeat this section until you come to "to coda" (sometimes it's written "last time to Coda"). When do I play the coda? When you play the refrain for the last time you have to ignore the 3 last bars (before the tail) and skip from "to Coda" directly to the coda and play the final bar. When do I play the coda? Where it says "To Coda", is the circle with the cross through it hovering above the exact place that you jump to the coda? D.S. al coda, or dal segno al coda, literally means “from the sign to the coda mark.” D.S. al coda is an indication to start back at the segno, play until you encounter a coda, then skip to the next coda to continue. The easy bit to answer is the coda part. After the words 'to Coda', there is one bar to finish off the previous phrase. Last time, you play the Coda bar instead. It's the same harmony, but finishes the song off. In other words, last time through, play the first 3 bars, then go straight to the 'target' at the end, and there's the final bar of the four. Coda, segno; How to repeat chorus 3 times? How do I enter Segno, Coda, D.S. al Coda into TuxGuitar? Are there established good practices for how to use musical navigation markers correctly?